Since then, we have kept meeting regularly. Mostly, we meet in each others homes. But also, we have social meetings at restaurants, cafes, theatre etc. We celebrate the Jewish festivals together. The Jewish Lesbian Group of Victoria has worked consistently and successfully to create significant change in Jewish, Lesbian, Feminist and LGBTQI communities around Australia. 'It's Who We Are" is being shown at the Classic Cinema! Click anywhere on the image to go to the Trybooking page to get your tickets. In 2012 we celebrated our 20th anniversary! 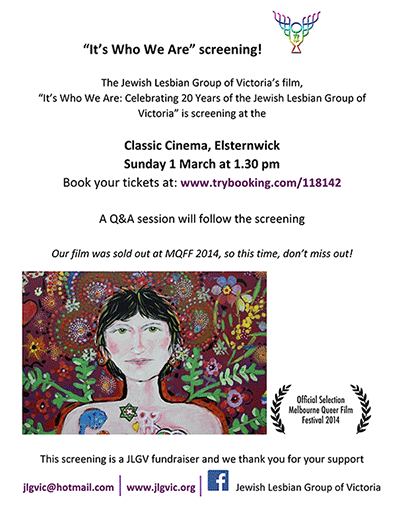 Part of our celebrations included the planning, fund-raising, production and editing of a half-hour documentary film, “It’s Who We Are – Celebrating 20 Years of the Jewish Lesbian Group of Victoria”, which tells our remarkable story. 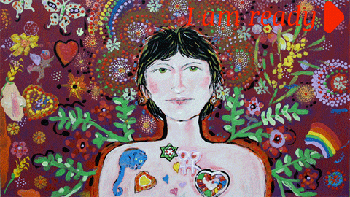 Watch our fabulous trailer for a taste of our delicious tale (just press ‘I am ready’ here). You can read our Press Kit which is being sent to film festivals as part of our submissions. We welcome any donation you can make to assist us in submitting our film to international festivals. Can’t make a donation? There are other ways to help. For more information, please ring Karen : 0419 576 764 or Shauna: 0411 812 282. This Web site was designed by Pat. Mitchell, WebWeaver and is the property of JLGV Inc. © Melbourne Australia 2006-2014.